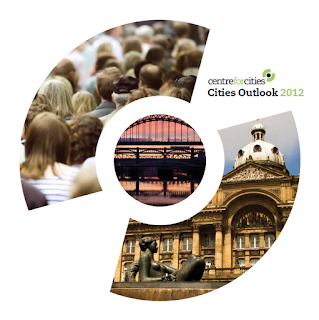 The first thing to note is that Cities Outlook 2012 uses Primary Urban Areas as a proxy for cities. See this document (and p.106-109 in particular). PUAs are not just the local authority area but rather a grouping of local authorities around a core local authority area. PUAs only exist for England (and there are 56 of them). For Scotland, Wales and Northern Ireland the definitions of 'city' are slightly different - see p.25 of Cities Outlook for more on this. This has been covered a lot elsewhere, but 'the recovery' is at present not looking very good when compared to previous periods of economic turmoil - the chart on p.7 is particularly illustrative of this point. There is no harm in reinforcing key messages, and Cities Outlook does this many times. The most important of which is probably: "Unemployment is likely to become an increasing problem in 2012". When the youth figures are taken into consideration (1m+) we can only speculate at how this will play out in the long term. Hull and Cambridge are not necessarily on the same trajectory! See p.15 for more on this. Of course this is not really a fair comparison in some ways but it does illustrate some of the important differences between cities. On p.31, I'm not convinced of the utility of the landmass comparison for the entire UK, particularly when the definitions vary across the UK (even if the graphic is quite pretty). Let's all move to Milton Keynes (p. 36). On second thoughts, maybe not. Three cheers for Aberdeen: "Every city in the UK apart from Aberdeen saw a decrease in their business stocks from 2009 to 2010". More information on business type would be useful here of course. A very interesting piece of work!